Floral Prints.All tricks about them. There are many ways of wearing floral prints.Many people think of them as for skirts only, but the reality check is that you can use them for earrings, hair bands, attaching them on a hat, on your wrist as a watch accessory, or on your sandals. Pick a print type. Choose a pattern that works with your personal taste and style. Flower designs can range from dainty and delicate to big and bold, each kind carrying its own personality and character. We’ve all seen traditional floral prints,maybe you wore them when you were young but you never realised they are so fashionable. While this look will continue to be popular, this year you can also expect to see a more contemporary take–large, statement-making graphic florals, on tops and dresses. There are even floral leggings and tights. Accessorize.Make a statement. Use florals as accessories.Floral print accessories are a great way to try the floral print trend as seasons transition. 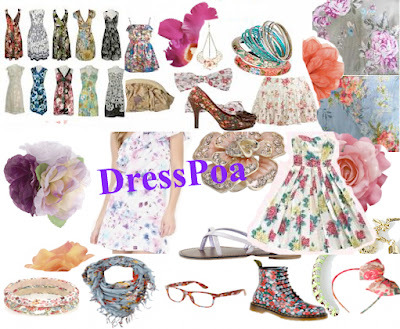 A floral print umbrella or pair of shoes will brighten up your day without looking over-the-top.The different accessorized florals you can use include a watch, a pair of sunglasses, shoes, scarf, bangles, chains, dresses or even hair bands. The choice is yours because you have so much at your hands to choose from.Make sure you dress perfectly. Be edgy. With the right outfit, floral print can also have an edgy feel. Instead of picking small patch florals, try a larger print in darker colors. As a bonus, these darker florals can be worn into cooler seasons, too!And you know what, we are approaching winter. Another way to give your floral look an edgier vibe is to pair a feminine floral with tougher accessories. Think a floral print dress with a leather jacket , or floral print leggings and a black tunic. Mix and match for a look that’s all your own! Use the Same Color Pattern.Once you chosen a floral print, match the floral with the rest of the clothing. Pay attention to pattern's colors, choose one or two, then work around your choices. From the small details to the most prominent shade, any color in the print is fair game. Because floral prints typically come in multiple colors, you’ll have multiple styling possibilities. And remember to use heels if possible. High heels and boots also look especially flattering with floral prints, especially if you're going for a more sultry yet fun look. Have a floral day.Wont you?